Maybe she’s innocent after all. Maybe she saw an oppurtunity and acted on it. Perhaps it was her plan all along but she had an accomplice take the fall. Who can say? 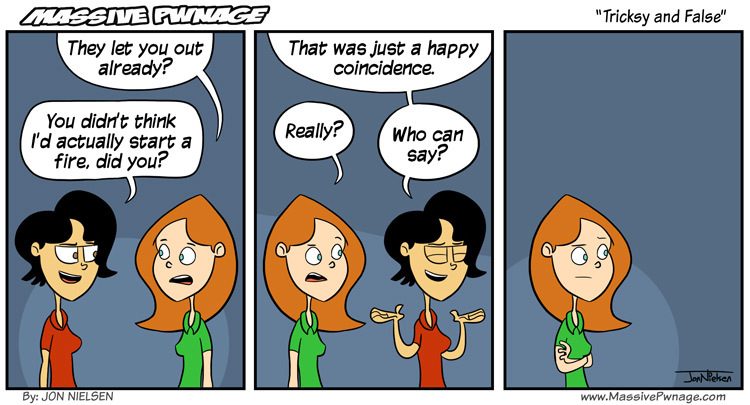 This entry was posted on Monday, December 12th, 2011 at 12:00 am and is filed under Comics. You can follow any responses to this entry through the RSS 2.0 feed. Both comments and pings are currently closed. Nah, then she would have to take care of the shop again. It was all the imp. He set a bomb up for Tika to set the pizzeria on fire so she could get away from the store. I was in Vegas that weekend.